The Neverending Reader – Why read one book when you can read them all? Why read one book when you can read them all? The world is facing some pretty big challenges in this next century. From issues of pollution to climate change to growing inequality to overpopulation, the list goes on on and on. Many are adamant that using large scale policy instruments to affect change is the best solution to our problems. But what this remarkable book outlines, and quite clearly I’d like to say, is that many people often forget that there are many examples of inventive, small scale solutions to these issues at the local level. Across the world, non-profits and governments are coming up with reliable solutions to difficult problems. This book is a carefully collected sample of these projects. The book was divided into five sections by topic. I’d like to highlight one project from each section. Utility: Playpump, South Africa – This product brings drinkable water to poor, rural South Africans that is powered by a play wheel for children, providing both drinking infrastructure and recreational infrastructure for children. The project goes to show that innovative, cross-disciplinary designs can be used to address real problems. Citizenship: CLEAN-India, India – This program taught young Indian students the principles of environmental monitoring and management, while also giving them resources to use these principles in their home towns. This empowered young people to be activist-agents over their environments and become advocates in their communities. Rural: Nelson Mandela Museum, South Africa – This was one of my favourites in the book. The Nelson Mandela Museum radically changes the way we perceive a museum, from being a static shrine to achievements, but into a living component of the community. The buildings can be used for community events and job programs are provided to local residents. Identity: OASIS, NYC – The OASIS (Open Accessible Space Information System) enables citizens and non-governmental organizations to interact with and add information to mapping infrastructure that the city directly uses to make informed decisions. It was really fascinating to hear about a product that clearly enables a more participatory democracy. Urban: Project Row Houses, Houston – Taking dilapidated row houses in Houston’s poor Third Ward, they were renovated into artist residences, low-income housing, and transitional housing for young mothers. A great project that provides local improvement without furthering gentrification. It is this slew of projects that really show that smaller projects can do great. big things in their communities. The smaller scale also allows for the cultural context and local identity to incorporated which would not be possible in some large scale solutions. It is this type of thinking that I think politicians and governments everywhere can learn a lot from. I would definitely recommend this book if you work in public policy, international development, architecture, or urban planning. As my literary journey continues, I seem to increasingly be drawn to stranger and stranger works of fiction. The more proudly weird, surreal, or unabashedly subversive a novel is, the more I like it. It is at this frontier of literature (heh see what I did there) that I find myself often. It is here that Can Xue’s remarkable novel lies. Frontier is set in the strange Pebble Town, a tiny village in Chinese interior up against the Snow Mountain. It is here that wolves roam the streets at night, gardens appear and disappear, and the world is not quite what we’re used to. This idiosyncratic narrative weaves in and out of the different lives of the people of this town. Can Xue is one of China’s foremost experimental writers. She has written several novels, poetry, and hundreds of short stories; many of which haven’t made it into English translation. She’s also a peculiar figure. Someone who takes her role a writer more seriously into something akin to performance art (she refers to herself in the third-person among other things). I’ve always been fascinated by people that take their art, and live it in the real world like that. But however you feel about her “antics”, there’s something about her writing that has started to get western attention (some even saying she could be a runner-up for a Nobel). This was my first introduction to her work, and my was it fascinating. There’s something about this novel that makes it feel like you’re lost, wandering in a dream. Put it perfectly in the introduction, it actually seems like the book seems longer than it is. And not in a droning, this is boring kind of way, but as an enthralling journey into the surreal, avant-garde mind of Ms. Xue. It is abstract. It is unconventional. It is experimental. Don’t pick up this book, thinking you’ll get some slightly weird SFF. But if you’re attracted to the aforementioned qualities at all. If you’ve liked the work of Kafka, Joyce, and other writers who traveled at the fringes of their literary times. This book is for you. Most of my reviews are based around my reading of a particular book, but this time I wanted to take some time to think about a variety of texts that I’ve been reading lately. If you read my last review, I talked about an indie leftist manifesto that I didn’t really agree with. But since then, I’ve read more and more about the idea of direct democracy and democratic assemblies, and I’ve come to rethink my positions around the idea. My ideas were first really changed after reading the collection of essays by Murray Bookchin titled The Next Revolution. This compilation of his works brought forward his main ideas of communalism, a political philosophy advocating for the communal pooling of resources by local councils that are democratically governed through people’s assemblies. Bookchin’s communalist theory draws from a variety of libertarian, socialist and anarchist ideas to complement his environmental philosophy social ecology. In this book, he presents a convincing argument that the only way to truly combat the environmental crisis is to radically change the paradigms of our society. Bringing people more in touch with their local communities and resources. It is these ideas that I think the Manifesto of Real Democracy, which I reviewed last time, drew their inspiration from. After researching this area more thoroughly, the ideas presented in this manifesto echoed much of the work established political theorists, such as Bookchin, had brought up for years. Although my intellectual interest in these ideas has shifted, I think the manifesto demonstrates their point in a much less convincing matter. Not to mention the intellectual dishonesty of presenting democratic assemblies and direct democracy as a unique synthesis of their own ideas. So what does this mean? I have been overcome with an intense fascination with these systems, studying and learning more about them wherever I can. However, I still have a strong faith in parliamentary democratic systems, as noted through my work on Democracy Kit. Especially in Canada, the unique combination of the three branches of government, the executive, legislative, and judicial, have demonstrated to be extremely effective; leading to some of the world’s highest standards of living, low levels of corruption, and leading the world in human rights and equality. Nonetheless, just because our current system works relatively well, does not mean there are not areas where it can improve. I think implementations of direct democracy can radically change the relations between people and government. And I think our current societies can benefit from a hybrid system of the two. Direct democracy throughout history was limited because of the growing scale of human cities and nations. There were simply too many voices to take into account to have “town halls” or “people’s votes”. However, new technologies have the potential to overcome this limit. I’ve been extremely fascinated by Argentine Santiago Siri and the Democracy Earth group. Earlier in 2017 they released a digital book on Github titled The Social Smart Contract. It is a fascinating volume outlining their plans for using blockchain-based smart contracts to create scalable, direct democratic systems. I see huge potential for this organization to demonstrate direct democracy in all different kinds of political systems and industries. Can corporations become more democratic? Can political decisions become more democratic? Will the people be able to truly influence the political landscape in the direction they want? I think Democracy Earth’s peer-to-peer voting technology has the potential to bring direct democracy into the 21st century. Another specific experiment in democratic governance is happening Northern Syria right now. The Turkish writer Abdullah Öcalan wrote in War and Peace in Kurdistan, as well as in his other works, about the idea of democratic confederalism. A unique system of politics that draws a lot from Bookchin’s communalism. After the withdrawal of government forces in northern Syria and inspired by Öcalan’s work, three cantons in this region gained de-facto autonomy as the Democratic Federation of Northern Syria or in Kurdish “Rojava”. This region is an extremely interesting political project where people live according to local democratic councils that elect equal parts men and women, and are conscious to represent different ethnic groups such as Kurds, Arabs etc. It is extremely fascinating because some of the ideas presented by Bookchin and Democrates that I mentioned earlier, are currently being implemented in this corner of the world. Despite clashes with ISIS and Syrian Islamist rebels, the DFNS continues to endure. It shows that this type of society is potentially politically viable. I think these two projects can make us rethink the way our current world is structured. I hope we can learn a lot of lessons as they continue to navigate this increasingly fractured and difficult world. I think a lot of people get hung up on the idea that these political theories initially stemmed from anarchist or socialist or libertarian schools of thought. To many, these words have been stained by popular culture and consciousness. I do not identify as any of these ideologies, but I am a person eternally fascinated by all aspects of political culture. I think we should take some time to truly reflect on all ideas, despite the preconceived notions we often bring to the table. I think these ideas, and their current experiments in exploration, can teach us so much about path forward. And I hope that the work of activists and politicians around the world move society in a better direction. Is direct democracy feasible or realistic or even safe? I’m not sure. But I think its intellectually dangerous to only entertain our current parliamentary/republican system as the only system that can work. I think experimenting with novel forms of democracy will enable us to move forward as a society. I can see a hybrid system of the two. Where elected officials represent and govern on most issues at the national scale, democratic and egalitarian councils work at the local scale in a “town hall” style, as well as using peer-to-peer voting to control issues of national interest. My current thinking of this hybrid style would blend the strengths of both systems, a true evolution of the way we think about and interact with democracy. I guess we’ll just have to see where the world takes us. I would like to note however, that I am aware of the allegations of human rights abuses by Turkey and Amnesty International that concern the federation’s militia, YPG. I do not in any endorse these actions if they are true. My fascination with the society is simply because it represents a working political system apart from the world dominant republican/parliamentary systems. I have a lot of different thoughts about this book. I picked it up while causally browsing the non-fiction section in an independent bookstore in a small rural Ontario town. It immediately caught my eye. An indie published manifesto on politics? It sounded right up my alley. After finishing it I would definitely say it was an interesting read, but I felt it particularly fell short in laying out a practical, realizable vision for world politics. The anonymous author argues that the modern global political-economic system gives citizens the illusion of democracy. That current republican/parliamentary representative democracies are facsimiles of true democracy, which was only achieved by the Athenians in ancient Greece. It also argues that transnational corporations and the world’s billionaires have created an economic system that closely resembles medieval feudalism. This rich minority keeps control by funneling money into political parties, perverting our democracies into nothing better than oligarchies. They argue that this is mostly a consequence of the our republican systems. That representative democracies can never give citizens true control over their political destinies and our bound to be corrupted by the rich to control outcomes. 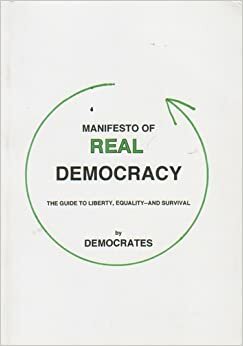 So the author proposes a new democratic model, what they called a Democracy Circle, modeled after the Athenian democracies. Instead of electing representatives, who often come from wealthy, upper class backgrounds, everyone should be involved in the political process by annually rotating with randomly selected citizens. They also argued this system of personnel rotation should be implemented for the legislature, the judicial branch, as well as for the civil service. The world would then be divided into a cross stitch of states ranging from small rural hamlets, all the way up to cities as large as 60,000 people using these systems. Now, I think the author raises some good points about money influencing our political process. Our political representatives in most republican and parliamentary democracies are often influenced by corporate donors. The author decries this as a fundamental flaw in representative democracies but in Canada, we’ve actually banned the use of corporate or union donors to federal election campaigns. Of course, there’s still other ways for businesses to help influence politicians, but there’s definitely ways to legislate those sorts of things out of the system. They also raise issue with the fact that most politicians come from a small, upper class minority of the population. I totally agree that this is a systemic problem in representative democracies, and it is an issue that needs to be addressed. (*Warning: Shameless plug incoming since I started working on it*) There are projects like Democracy Kit where they are trying to allow people without political connections or business connections have the resources and knowledge to run for political office. There are people working on these sorts of issues. I think redoing our entire political process in the fashion the authors suggests is unnecessary if we properly concentrate our efforts to solving these problems. In regards to their proposed political system, I think the author over idealizes how ancient Athenian democracies actually worked and how implementable they would be for modern society. They argue that using this system would get rid of political parties and allow votes to truly represent the will of the people. However, I think this would actually do nothing to remove political parties. These parties exist to gather greater voting power to achieve common goals. I think it is in human nature to want to cooperate and work towards shared objectives. I feel like there is nothing that would make the everyday person less eager to do this than career politicians. Having the politicians be constantly rotated would also lead to constant changes in policy direction. Nothing would ever be achieved if people are constantly voting yes on things one year, and no on the other years. Programs and policy would constantly be rescinded and renewed, leading to roadblocks in the political process. I also think having a civil service that is constantly rotating with people would be disastrous. Having no long term staff to see through policy that would take longer than a year to implement would be insane. There would be no long term domain experts and knowledge would constantly be lost. Finally, I don’t see how it would be possible for the entire world to consist of small city states. There’s a reason there aren’t many of these existing out in our current world (Singapore being a notable exception). Larger governments and states can achieve economies of scale and allow for the distribution of resources from wealthier areas to more troubled ones. How does a small rural hamlet that is supposedly self sufficient expect to raise enough capital to fund infrastructure or build services like hospitals, jails etc. I think this was a serious oversight on the authors part. These are just some of the flaws I saw in this authors vision for the world. They made some interesting points and comparisons, but overall I felt like they fell flat of laying out a a plan that is in anyway practical. I would rate this book a 4/10. I would recommend this book only to people that truly love reading a wide variety of political material, and don’t mind stuff that isn’t necessarily feasible. Conservatism, as a movement, is at a crossroads today in Canada. With the rise of right-wing populism in the United States, conservatives have to weigh this path against the established ideals of the traditional Canadian Tory, which has its own unique history and principles. A question that will be placed on full display in the upcoming election for the leader of the Conservative Party of Canada in May. Radical Tories: The Conservative Tradition in Canada dives into the incredible history of the conservative thought in Canada from the times of Confederation up until the time of the book’s writing in 1982. Each chapter in this book follows a different conservative writer or thinker to search for what makes up the Canadian conservative tradition. The book is insightful, revealing, and at times quite funny. I rated it a 9/10 because it is an amazingly thorough exploration about the conservative movement in Canada. I could not recommend this book enough. If you are at all interested in Canadian political history this is a must read book. The Literary Review of Canada listed it as “one of the hundred most important Canadian books ever written”. It is definitely ranked among one of my favourite non-fiction reads. For them the words [conservative] conjure up a bloated, top-hatted capitalist intent on grinding down the poor and filling his pockets with the fruit of their toil. To the extent that he still exists, however, this character has nothing to do with our indigenous conservative tradition. Both the robber baron and his slicker successor, the “neo-conservative”, are right-wing liberals: their natural habitat is the United States…. According to Grant, this American conservatism has little connection to traditional conservatism…. Unlike the caricatured capitalist, Canadian conservatives believe in an organic society and the mutual obligations of all classes. In this book, Taylor warned that the conservative movement was losing sight of its traditional roots and urged them to shift back from their recent “neo-conservative” trends. After almost forty years, I would argue that the modern Conservative Party has shifted even farther away from these tenants of traditional conservatism. Conservative politics in Canada continues to increasingly mimic our neighbours to the south. A huge question that Conservative party members are asking themselves with the upcoming election. As a person who identifies strongly with the political left, it was interesting reading about these policy positions that the traditional conservatives embraced. I could definitely see myself more strongly considering voting for a conservative party with these ideals; instead of the current party who has a poor environmental record or whose leading candidate in the leadership race wants to sell Senate seats for the highest bidder. I would argue that if the Conservative Party of Canada looked to its past to better influence its policy future, it could have a much larger appeal to a broader base of Canadians, and more specifically young Canadians like myself. Debates over government are a time-honoured human tradition. Whether over a beer or at the family Christmas party, politics and policy are what everyone can agree to disagree on. Everyone has their own opinion about how the government should be run, whether on the left or the right, and the usual sentiment is that the current government isn’t running things properly. But with all this rhetoric being thrown around the issue, I decided to read a bit more on it and came across this wonderful little book in the university library. The main premise is that the current 21st century world consists of multiple interacting systems and networks of people, where power is diffused among them unequally. This include the state itself, as well as corporate and community interest groups. In its current form, the government assumes hierarchical, top-down responsibility for certain issues, and sets out to use its resources to solve it. That has been the traditional model in which the government has pursued to achieving its goals. What Hubbard et al. are asserting is that this is not an effective means for the government to pursue socioeconomic outcomes. They are saying there needs to be a radical rethinking about the way the government governs, or as its termed “metagovernance”. With power diffused among various organizations, governments are no longer leaders in the traditional sense but stewards (hence the title) that help guide and steer collective actions to a specific outcome. This means a few things: it calls for a reunderstanding the government’s context within society and the level of communication/collaboration it has with key stakeholders on issues. It also means that governments need to look more at iterative and experimental approaches to solving issues, and using social learning to allow the network to self-govern itself. All of this would mean changing the fundamental structure and operation of the government. I rated the book a 7/10. I thought the book put forward some really interesting ideas on the way government policy should be enacted. I particularly enjoyed that they did case studies at the end on four separate Canadian issues that really displayed the idea of collaborative decentred metagovernance. This is a very academic book so I would warn against reading this too casually, although its not too long to get through. It has been interesting these last few weeks as I’ve been really getting into reading about politics and government. Books like these really challenge the notions and thoughts you have about a topic everyone likes to talk about. Would definitely recommend the book if you are interested in government and public policy. Territorial rights are a hotly contested issue across the world today. Russian-annexed Crimea, the conflict in Iraq regarding Kurdistan, Indigenous and First Nations groups fighting for control over historical lands, oceanic conflict in the South China Sea, Israeli-Palestinian conflict on the West Bank; all of these events have made international headlines in recent years. And it has begged the question: how can we decide who has the right to control any one peace of land? Margaret Moore’s book explores this particularly thorny and contested issue. Her theory outlines a few key characteristics of rightful ownership of territory: the people share a political identity to express their right to self-determination, they rightfully occupy that land, and they have a continuing relationship with the land and its resources. Now these are very general criteria and one can easily see that there might be holes, but Moore goes into detail about the merits and pitfalls of her theory. She compares it to other theories of territorial rights, and explores the theory in terms of real life historical and present examples of territorial conflict. These case studies of practical application of her theory were parts I particularly enjoyed about this book. I gave the A Political Theory of Territory a 6/10. I think the topic is very pertinent to modern day geopolitical conflict, both internationally as well as domestically here in Canada. I didn’t actually agree with Moore, but I think she presents interesting arguments and surveyed the issue from a (relatively) neutral stance. I would definitely recommend this book if you’re into geopolitics and international relations. However, the book is very academic and can get a bit dry at times. Unless you’re truly interested in the topic, I would probably warn that you might not be able to enjoy it.